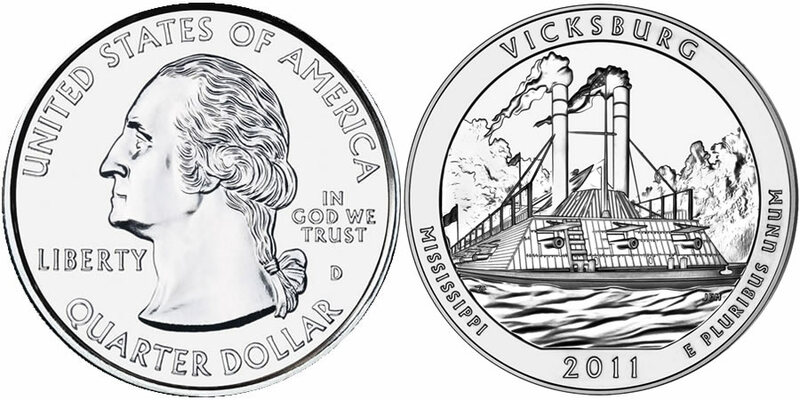 Appearing as the fourth America the Beautiful Silver Bullion Coin™ for the year from the US Mint was the 2011 Vicksburg Silver Bullion Coin which honors Vicksburg National Military Park on its reverse. The US Mint released the coin for sale through its network of authorized purchasers on June 20, 2011. This series of coins are struck for investors from five ounces of .999 fine silver, but are highly sought after by collectors owing to their relative rarity and the fact that they feature designs representative of sites from around the United States. These designs are also found on two other series of coins from the Mint, the circulating America the Beautiful Quarters® Program and the America the Beautiful Five Ounce Silver Uncirculated Coins. Vicksburg National Military Park was established by the War Department on February 21, 1899 "commemorate the siege and defense of Vicksburg." This is in reference to the American Civil War Battle of Vicksburg which lasted for 47 days and the greater Vicksburg Campaign which preceded the battle for several months. John Flanagan designed the portrait of George Washington, the first President of the United States, that is featured on the obverse of each America the Beautiful coin. The image of Washington was first used on the 1932 circulating quarter dollar and has been in use on the quarter ever since. Also shown should be the inscriptions of "UNITED STATES OF AMERICA," " LIBERTY," "IN GOD WE TRUST" and "QUARTER DOLLAR." 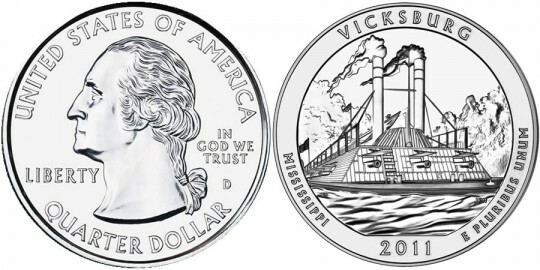 The reverse of the Vicksburg coin was designed by AIP Master Designer Thomas Cleveland and sculpted by United States Mint Sculptor-Engraver Joseph Menna to depict the American Civil War era gunboat USS Cairo steaming down the Yazoo River. The gunboat was partially restored and is on display at the Vicksburg Military Park. Included as well on the reverse design should be the inscriptions of "VICKSBURG," "MISSISSIPPI," "2011" and "E PLURIBUS UNUM." "999 FINE SILVER 5.0 OUNCE" is shown on the edge of these strikes.